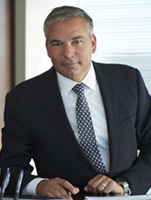 Gary Vogel currently serves as Chief Executive Officer and a Director of Eagle Bulk Shipping Inc. (NASDAQ: EGLE), a Stamford, Connecticut-based drybulk ship-owner/operator focused on the Supramax/Ultramax asset class. The Company's owned-fleet currently totals 46 ships, making it one of the largest global owner/operators in this segment. All vessel management, inclusive of strategic, commercial, and technical, is conducted in-house from the Company's offices in Stamford, Singapore, and Hamburg. Prior to joining Eagle in September 2015, Mr. Vogel served as Chief Executive Officer and was a Director of Clipper Group, Ltd., one of the world's leading privately-held ship owning/operating groups. Prior to his tenure at Clipper, Mr. Vogel worked at Van Ommeren Bulk Shipping (USA) from 1992-2000, culminating in a role as President. Mr. Vogel began his shore-side shipping career as a dry cargo shipbroker in 1988- where he was employed by Pinney, Inc. and later Skaarup Shipbrokers. Mr. Vogel is a New York native and graduate of the U.S. Merchant Marine Academy at Kings Point, NY, where he graduated with a B.S. in Marine Transportation, as well as a USCG Third Officers Unlimited Tonnage License. He sailed briefly on container ships and product tankers, and served as an officer in the US Naval reserve. Mr. Vogel has also completed executive programs at the Wharton School of the University of Pennsylvania. In industry-related capacities, Mr. Vogel serves as a Director of Ship Finance International (NYSE: SFL), as well as on the Lloyds Register North American Advisory Committee. Previously, he has served on the Board of Directors of the American Institute for International Steel, and as Membership Chairman of the Association of Shipbrokers and Agents. Mr. Vogel has also been a member of Young Presidents Organization International (YPO/YPO Gold) since 2004, and serves as a Board Member of its Fairchester Gold Chapter.